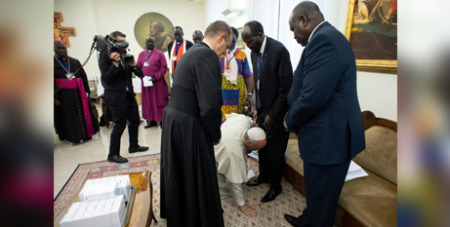 Pope Francis yesterday knelt at the feet of the leaders of South Sudan, begging them to give peace a chance and to be worthy “fathers of the nation”. Source: CNS. “As a brother, I ask you to remain in peace. I ask you from my heart, let’s go forward. There will be many problems, but do not be afraid,” he told the leaders at the end of a spiritual retreat for the political leaders of warring factions. “The purpose of this retreat is for us to stand together before God and to discern his will,” he said in his formal remarks yesterday, closing the two-day retreat in the Domus Sanctae Marthae, the Vatican guesthouse where he lives. The retreat was the idea of Anglican Archbishop Justin Welby of Canterbury, spiritual leader of the Anglican Communion, who attended the final part of the gathering. He and Francis have been supporting the peace efforts of the South Sudan Council of Churches and, the Pope said again yesterday, they hope to visit South Sudan together when there is peace. Francis told the politicians and members of the Council of Churches that “peace” was the first word Jesus said to his disciples after the resurrection.